Class of ’83 locker in new Purdue football complex. 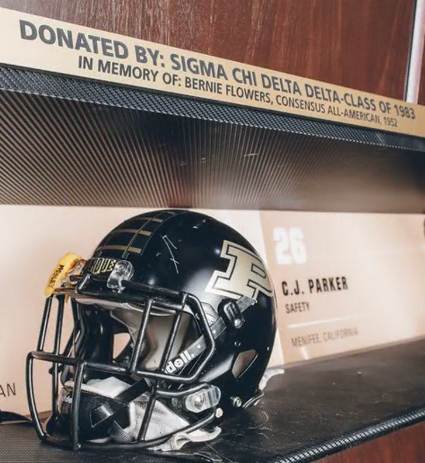 The Class of ’83, through the efforts of Joel Hammond ’83, honored the memory of Bernie Flowers by naming a locker in the new Purdue football complex in his honor. Bernie Flowers, the father of Kerry Flowers ’83, was a consensus first team All-American who played end for the Boilermakers from 1950 – 1952. In his senior year Flowers set school records with 43 receptions for 603 yards and seven touchdowns. This helped lead Purdue to a share of the Big Ten Conference title in 1952. Bernie Flowers was inducted into the Purdue Intercollegiate Athletics Hall of Fame in 2003. To see a brief video of the new football locker room go to Flowers Remembered by Class of ’83. Any award to Bernie Flowers for his football prowess is well deserved. Thank you for you efforts in getting his recognition in the new facility.